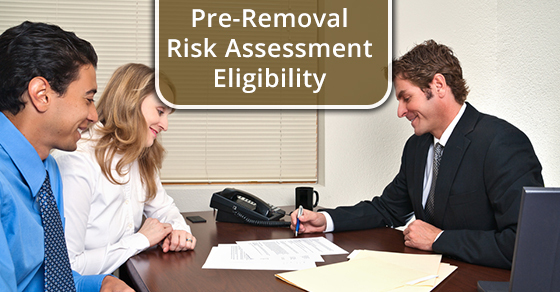 How To Know If I’m Eligible To Apply For A Pre-Removal Risk Assessment? A Pre-Removal Risk Assessment (PRRA) is a chance for those who are at risk of having to leave Canada to outline the ways in which they would be put in danger if they were forced to leave. Danger can come in a variety of forms; they could be at risk for being persecuted, they could be at risk for experiencing cruel behaviour or their life could be threatened. An immigration officer is ultimately responsible for determining whether or not you are eligible to apply for a PRRA. In the majority of cases (there are exceptions, as you will see below), if you have applied for refugee status or a PRRA and your application was not accepted for any reason, you are not eligible to apply for another PRRA for at least one year. However, again, there are exceptions. If your country has suddenly undergone changes, you may be eligible to apply for a PRRA sooner. To find out if the conditions in your country fall in this category, please consult the CIC website. If you made a refugee claim but it was determined that you were ineligible because you travelled to Canada from what is considered a safe country, you are not eligible to apply for a PRRA. If you have been granted refugee status in another country that you may return to, you are not eligible to apply for a PRRA. If you are subject to extradition – that is, a formal request that you should return to your country because of criminal activity (whether suspected or convicted), you are not eligible to apply for a PRRA. If you are eligible to apply, you will have 15 days to do so once you receive your application and guide. If you received your application via mail, you will have an additional 7 days. Max Berger Professional Law Corporation is a leading Canadian and full-service immigration law firm since 1987. For more information, contact us here.